College is normally a place of great diversity, where students can choose what they want to learn about in class as well as in experiences outside of class. Students come from many different high schools and backgrounds to learn together and meet people that have had different upbringings than what they have known. 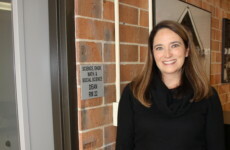 DMACC is a great example of this, with the largest enrollment of any college in the state and a wide variety of class and course selections, it attracts students from all over the state as well as surrounding states for recognized programs like dental hygiene and the Iowa Culinary Institute. Students leave with degrees and new friends that they never would have met if not for the college experience. This level of diversity and new friendships might be shown best within the DMACC men’s basketball team. The team represents all corners of Iowa with players from Davenport, Clear Lake, Ames and Perry, three student-athletes from Illinois, as well as representation from Texas, Brooklyn, New York, Las Vegas, the Twin Cities, and even London, England. Zach Lester is a freshman on the basketball team averaging 6.9 points in 18 minutes per game. He had basketball offers from NIACC and Iowa Lakes community colleges which are closer to his home, as well as Grandview. He also had offers to walk-on to the Iowa and Iowa State football teams as a receiver. “I wanted to get out [of Clear Lake] and see what’s out there,” Lester said. Clear Lake has a population of 7,562 as of 217. After averaging 30 points per game for Clear Lake High School in 2017, Lester chose to attend DMACC for basketball. “I think it’s cool there’s almost a separate campus for athletics, it’s really like a community here. 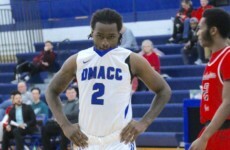 It’s fun to hangout with teammates and athletes in [other DMACC] sports and see what their life is like,” he said. Lester said the proximity to the the larger town of Ames and the university within influenced his decision, wanting to go to college in an area with a larger population. “I really like the area, we’re by Ames so there is a lot to do,” he said. “I’ve never been around that type of atmosphere, Mason City is the biggest city by us.” he said. 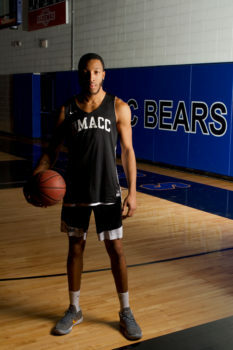 In contrast to Lester’s desire to go to college in larger city-like atmosphere, Zaire Swaby chose DMACC in part because of what he sees as a small-town community where he can focus on basketball. Swaby is a sophomore forward averaging 5.4 points, 3.6 rebounds and 1 block in 15 minutes per game this season. Swaby spent last year playing at Motlow State College in Tullahoma, Tennessee (pop. 17,229). Smyrna, Delaware, because they wanted me to have better [opportunities]. There’s a lot of bad energy in high schools in New York . . . [Smyrna] was a good high school for me to go to, it’s like at DMACC: not a lot of distractions, everybody knows everybody,” he said. Smyrna has a population of 10,023 according to the 2010 census. 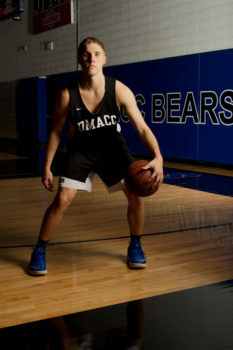 “I think [Boone] is a good place for sports because there’s not too many things around here to distract you, I like that because I came here to get better at basketball, try to earn a Division 1 scholarship,” Swaby said. Like Lester, Swaby has chosen colleges that are not the environment he grew up around, but a place that he feels can forward his basketball career. Although for these two basketball players, their backgrounds are extreme opposites. Another extreme from the atmosphere of Boone would be Atlanta, or London, England, the two places Kyle Dennis-Nelson has called home before coming to Boone. “I’m not used to the quiet, I’m still getting adjusted to the quiet [of Boone],”Dennis-Nelson said. Dennis-Nelson grew up playing soccer in England, and didn’t play organized basketball until he was 15. He played basketball at Oaklands College, which is located outside of London before going to Action Sports Academy in Atlanta, where he studied college preparatory courses while playing basketball at a higher level than he had experienced overseas. 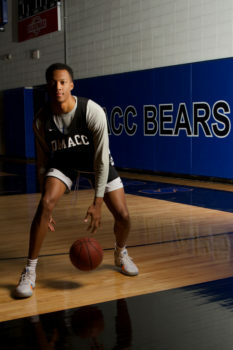 Dennis-Nelson has been very meticulous with where he has played basketball, choosing Oaklands, ASA, and DMACC because of what each has offered him to get to the next level, and DMACC’s unique experience for athletes played a part in his decision as well. “I like it how all the sports live together. Everyone is on the same page, to get to the next level. The fact that we all live together, it makes [the basketball team] be better as a brotherhood,” he said. Lester grew up playing hockey more than basketball in rural Iowa, Dennis-Nelson mainly played soccer in London until he was 15 and Swaby grew up in the most populous area of America before experiencing smaller communities. Besides the sport they all claim to love, what the players have in common is that they chose DMACC because of what it offers. 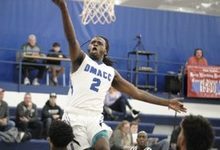 With the dedicated athletic dorms, committed and driven coaching staff, and history of elevating players to higher levels of basketball, DMACC is attractive to any basketball recruit, no matter the player’s background or experience.